We marvel at the creativity of the artists and designers we represent: They show us so many new and interesting ways and techniques to come up with fascinating, clever ideas for accessories, namely for scarves, shawls and jewelry. With our limited gallery and jewelry display case, we choose to pair jewelry with garments that make it easy for you to wander around the store and see how colors and textures combine as you create your unique “look”. 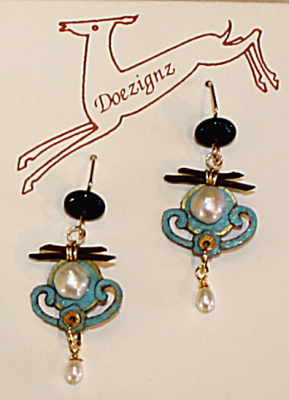 We have added beautiful jewelry from Debbie Hilaski at 2Hawk Designs in Penasco, and the handcrafted metal jewelry from Rae Dollard Studios in Santa Fe is hard to resist. We've also added magnetic pins -- perfect for fastening silks and handwovens -- from Wrap Snaps and our own Colleen Launer Yarbrough. 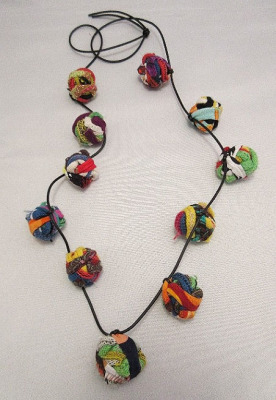 You'll also love our collection of Peruvian made necklaces from Beyond Threads. We will continue to carry a large selection of necklaces and earrings by Teresa Goodall. Known for her remarkable sense of color, Teresa makes jewelry that incorporates both fashion and timeless beauty and fits any style. You won't be able to resist the unique wooden jewelry pieces with a tribal flare by Sylca Designs. They add color and character to any outfit without weighing you down. We always love the beaded cuffs and rings by Santa Fe designer Tana Acton... And just for fun, we added a selection of colorful fabric necklaces, bracelets and pins from Diana Taylor at Ficklesticks that you won't be able to resist for yourself or a gift. We also have a nice selection of wire mesh jewelry from Sarah Cavender Metalworks, and contemporary necklaces from Greek Designer, Christina Brampti. Carogi bags are an all time best seller at Artemisia. You can change them from a backpack to a shoulder bag, and even to a cross body messenger bag. And if that isn't enough, you can also change the bag from the ever popular triangle shape into a square. We first ran into Carson Rogers, the genius designer behind these versatile Carogi bags, at a craft show in Santa Monica in 2004 – and the rest is history! Gerri Calpin is a Denver artist with an uncanny eye for color, proportion and subtle elegance. Besides her wonderful "shards scarves", we now also carry her unique, one of a kind Polymer Clay earrings and necklaces. All of Gerri's "shards" scarves incorporate scraps of fine silks, stitched together in a free looping motion. They may look delicate, but are surprisingly sturdy and quite durable. We also carry an assortment of her colorful and functional eyeglass cases and "Off the floor masterpiece" note cards. 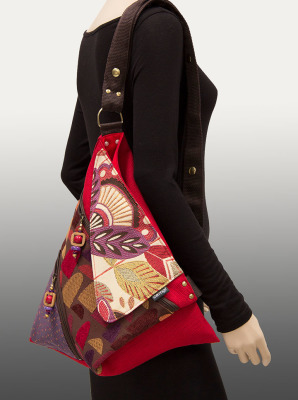 Our customers just love the fun, colorful, and oh so bohemian tapestry bags by Maruca. Based in Boulder, CO, all of their tapestries are designed and produced for them in the U.S. and the bags are made in Boulder. If you'd like to see more of the work of any of the designers featured here, please give us a call or email us. We have an excellent selection of designs and styles available from each designer, and would be very happy to send you pictures of currently available garments. You might also find what you're looking for on our Online Shop . Enjoy!